It's still only a patent, but Apple has a clever way to overcome the need for more ports on laptops: magnetic stackable expansion ports. Apple was just granted a patent for the idea, and it could find its way not only to the MacBook, but to the iPad, too. 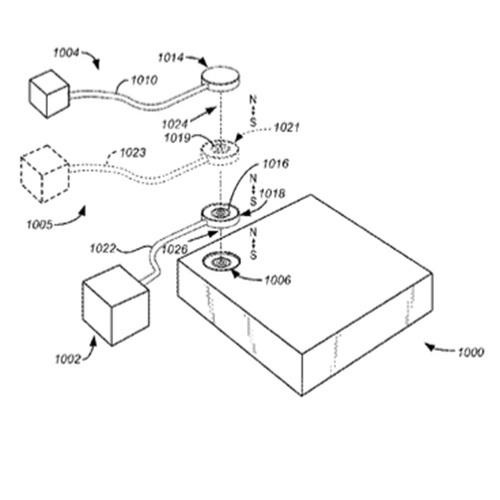 Apple patent 9,300,083, titled "Stackable Magnetically-Retained Connector Interface," describes a system where a single-port computer, like the MacBook, has a special MagSafe-style connector where USB, Ethernet, video, and other ports could be stacked together. This looks like a clever way to overcome the concern some people have over the MacBook's single USB C port and address situations where wireless device connections aren't an option. It's also intriguing as a potential iPad feature because it would expand the flexibility of Apple's tablet and make it an easier laptop alternative. There isn't any guarantee Apple will bring its magnetic port connector to its products, but it looks like a great idea that hopefully will show up at some point.